From petrochemicals, to pigments, to beverages, the color characteristics of translucent liquids are often vital to a product’s performance in the marketplace. Alcoholic beverages such as wine, beer, whiskey, scotch, and tequila are high-margin consumer products where color plays an important role in buying decisions in a store setting. This is because color is one of the few attributes that a customer can evaluate before a purchase is made. For instance, many whiskey drinkers associate dark, golden hues with quality, age, and a premium price. In a twist of psychology, color can even impact one’s perception of flavor and aroma. In a famous study by Morrot et al. (2001), researchers fooled a group of wine experts into believing a glass of white Bourdeaux was actually a red, simply by adding artificial food dye! 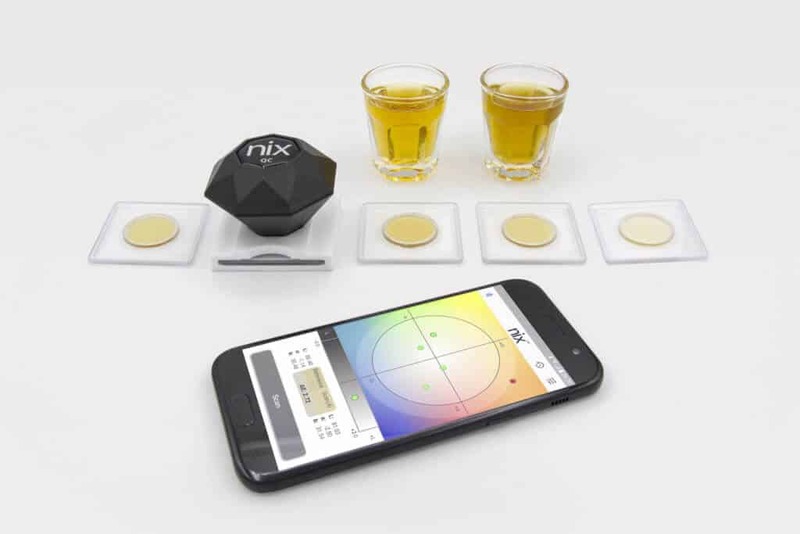 World leading beverage companies – as well as artisanal producers – are well aware of the impact that color has in the overall performance of their products and pay close attention to color changes at all stages of the production process using specialized tools such as the Nix QC colorimeter. With detailed colorimetric data, quality control managers can ensure a consistent, standardized color within or between batches and can quickly make changes to upstream variables if the color begins to drift away from a chosen color standard. For example, whiskey makers track color in many different timepoints in the distilling and barrel aging process to ensure the final product that you see at your local liquor store is a beautiful, appealing hue – and is consistent across the shelf. How is the Nix QC used in the whiskey industry? 1. An exceptional bottle of whiskey with an attractive color profile is deemed the standard or “master”. 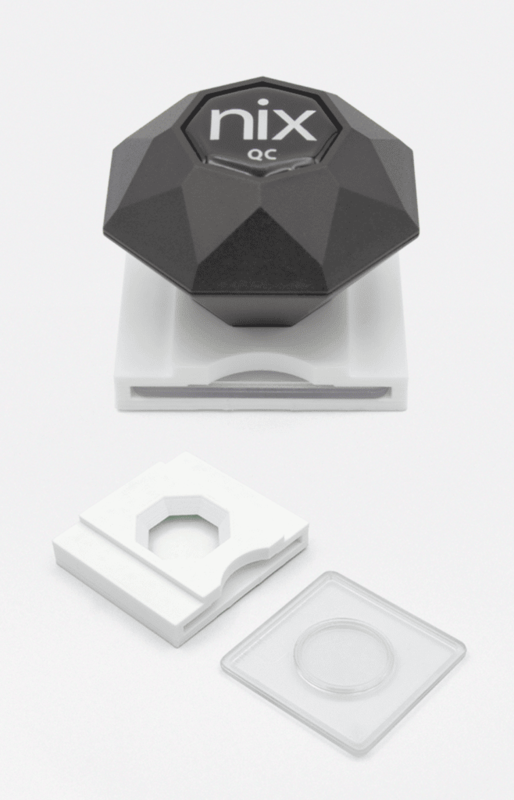 Its color is measured using the Nix QC Liquid & Powder Adapter and entered into the Nix QC app. This measurement (stored in the L,A,B color space) will be used to compare subsequent batches of whiskey. Note: depending on the production process, a unique master color for each step may be used. For example, in a 10-year aged whiskey, the change in color over time can be tracked by using a master color for each year to ensure the aging process is going as expected. The Nix QC app stores these master colors which can be selected when needed. 2. A threshold DeltaE value is inputted into the Nix QC app. This DeltaE value represents the acceptable variance in color compared to the “master”. Depending on the industry, different DeltaE values would be deemed acceptable. 3. 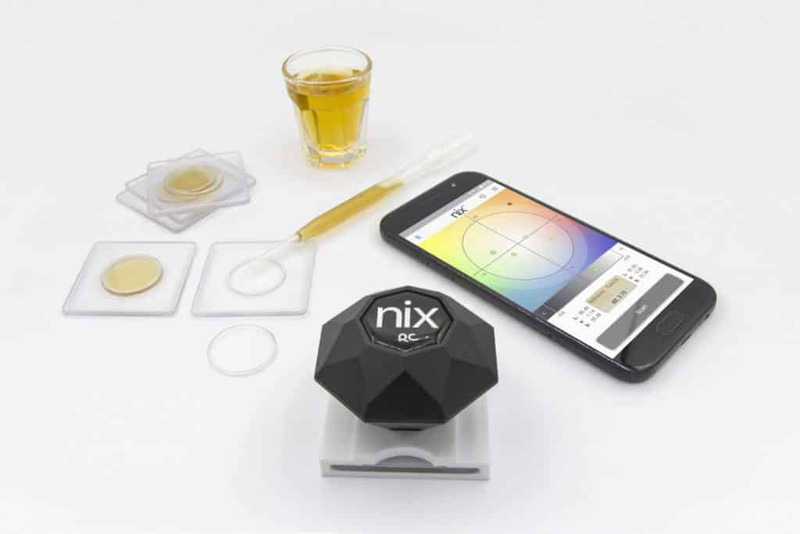 Quality control experts are now able to measure whiskey samples using the Nix QC Liquid & Powder Adapter at each step in production. Based on these measurements, the Nix QC app can tell the user whether the batch is within the acceptable threshold or not. The Nix QC app will alert the user if the batch is outside the threshold OR is beginning to drift out of the threshold, and will clearly show which direction – in the L,A,B color space – that the color is drifting. This information can be used as the basis to alter upstream variables such as blend ratios, aging time, and the level of barrel char to ensure subsequent batches fall in line with the master color. One of the most common production variables in American whiskey is the addition of a caramel colorant (known in the industry as E150a) to artificially darken the liquid. According to American whiskey regulations, whiskey producers can add up to 2.5% of caramel colorant to the mixture. The precise amounts needed from batch to batch can be determined based on color data from the Nix QC. Maintaining color quality and uniformity in the production of whiskey ensures the product stands out in a crowded market and conveys a solid first impression to the end customer. The color perceived by the whiskey drinker will impact their overall impression of quality, and ultimately lead to the commercial success of the product.